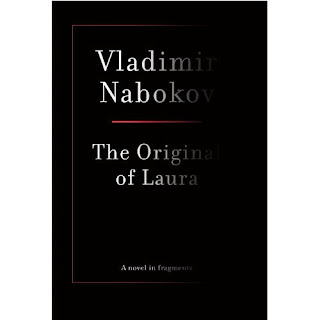 Below is the cover of Nabokov's The Original of Laura according to Amazon. I don't know who designed this but I can't imagine the stress they had to deal with the get this right. I think it works! I love the fading letters; we don't need to see the full name and title because we know exactly what it is and arguably have been waiting for this book for 30+ years. But what about those readers who don't know Nabokov? While I adore this cover, I can't imagine it does much for someone who is not familiar with the author or the work. What do you think? It's fantastic! Unfamiliar readers will either happily enjoy a novel by "Vladimi Naboko"or they will investigate the author and learn about Nabokov. Also- the fading! The black! It looks like a last breath or a funeral. It's a Chip Kidd jacket. I don't know for sure that that's the final design. Will let you know if it's not.